"These fragrant biscotti are even more wonderful dipped in chocolate." In a medium bowl, cream together the butter and sugar. Beat in egg. Stir in the orange zest and orange liqueur. Sift together the flour, baking powder, salt and cinnamon, stir into the creamed mixture, then stir in the almonds and dried cranberries. On a lightly floured surface, divide the dough in half. Roll each half into a log about 1 1/2 inches wide and 10 inches long. Set the rolls lengthwise on a baking sheet at least 3 inches apart, and flatten slightly. Bake for 20 to 25 minutes in the preheated oven, until firm to the touch and slightly brown on the top. Cool for 10 to 15 minutes, then slice each log crosswise, at a diagonal, into 1/2 inch wide slices. Lay them cut side down on the baking sheet and return to the oven for ten minutes, turn them over and bake for 10 more minutes. Cool on wire racks, store in an airtight container. These keep for over a month. 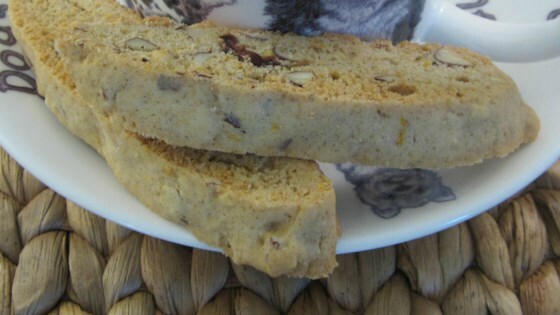 Authentic Italian biscotti with distinct, surprising flavors. This recipe crumbles too easily when you eat it. Biscotti I have made are pretty "crisp". I think it's a little too much like a "shortbread" vs. biscotti recipe. Excellent.. easy and delicious. The cinnamon really does add an extra punch. Followed it exactly as written.